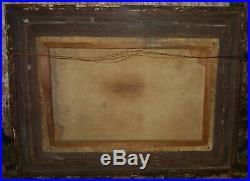 Original Wooden Tray Painting. 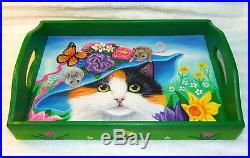 Title: ” Miss Emily’s Easter Bonnet tray “. Size: 11 3/4 inches wide. 2 3/4 inches tall. 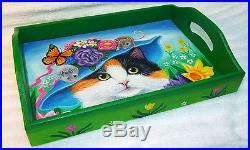 Description: I have hand-painted this wooden tray with a beautiful calico kitten in her Easter bonnet with two little mouse friends and spring flowers. The sides are painted a spring green with tulips and tiny white flowers. 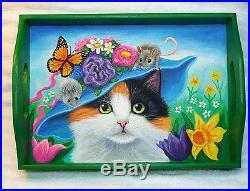 This would make a great gift for a cat lover! 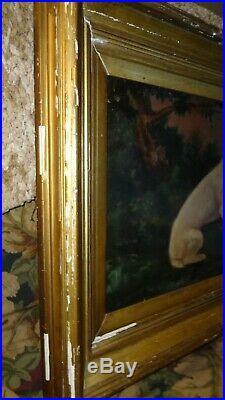 Signed and dated on the bottom and varnished for protection. Certificate of Authenticity included. Feel free to contact me if you have any questions or comments. I love hearing from art lovers! See my Other Auctions. Thank you for viewing my art! Copyrights: I retain all copyrights to my art. Copying or reproducing my works in any form is illegal without my express written consent. 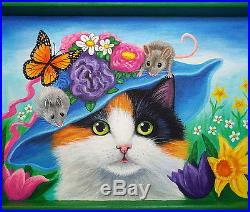 The item “Original OOAK kitten cat mouse Easter bonnet wood tray folk art painting” is in sale since Sunday, March 19, 2017. 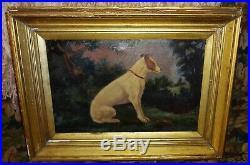 This item is in the category “Art\Direct from the Artist\Paintings”. The seller is “star-filled-sky” and is located in Florence, Colorado. This item can be shipped to North, South, or Latin America, to United Kingdom, to Germany, to France, to Australia, DK, RO, SK, BG, CZ, FI, HU, LV, LT, MT, EE, GR, PT, CY, SI, to Japan, SE, KR, ID, to Taiwan, to Belgium, to Hong Kong, to Ireland, to Netherlands, PL, to Spain, to Italy, to Austria, RU, IL, to New Zealand, SG, NO, SA, UA, AE, QA, KW, BH, HR, MY.